It’s been one month today since we’ve been away. It’s hard to believe a month can go so fast. It’s funny, I don’t miss being at home at all. Last night I woke up and started thinking about the garden, but other then that I haven’t thought much about the place. Right now I’m sitting in our little kitchen in Tokyo all by myself. The only noise is the hum of the fridge and the sound of the trains going by. the kids are not here and it’s so lovely and quiet. I’m at home today with a wicked cold. We have booked a babysitter for tonight (which was no easy feat) and so I’m trying to rest up for going “don-stop” tonight. Don and the kids are out looking for a new stereo for our ipod. We have one but, shopping is contagious in Japan and it gave them something to do. Travelling with kids is completely different then travelling in any other situation. You have to let things unfold as you go. Gone are the concrete plans, the late dinners, the idle boozy lunches (well mostly), and the long shopping trips. Usually we set a goal (lunch, a museum, a store), and then meander to that spot. Some days work out brilliantly (see Hallowe’en) and some days are a collection of frustrations. Just the other day when we attempted to go to the modern art museum of tokyo, we got there and it was closed (wednesday?) 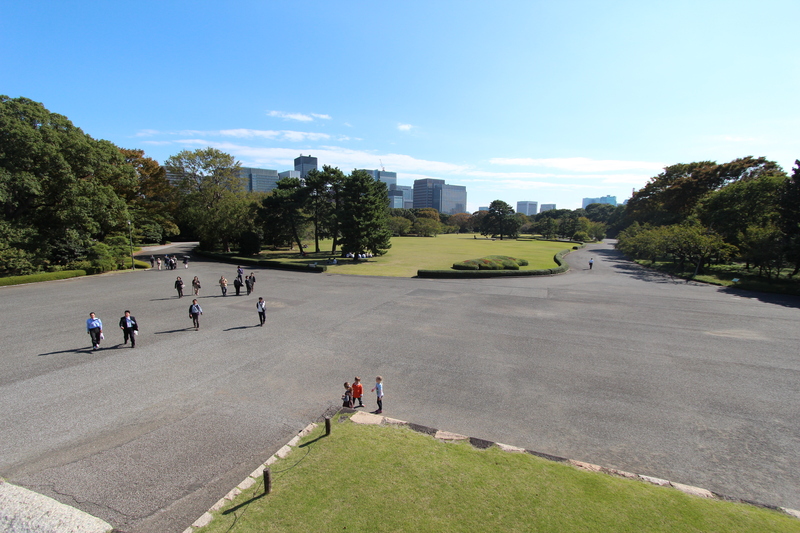 and then we went to the science museum (also closed), so we wandered to the imperial lawn (which the kids loved and was impressive but was a little tame). So we sat on the lawn until they had satisfied themselves running around and we could move along. We managed the long walk back over to the city “My feet hurt”, “I’m thirsty”, had to find a metro, found the metro, made a new plan (a museum…hopefully it’s not closed), and then came out of the subway only to find we were in a land of giant buildings and consulates. “I’m hungry”. RRRRrrrr. The blocks looked long, everyone was starting to unravel… and then there it was “Chez Pierre” like a mirage. We stepped inside and like a dream we were in France in a bistro being offered champagne and coq au vin. We all switched into french and the kids didn’t even notice they were eating creamy oyster stew, they were just happy to be sitting down! The lunch fortified us and we went to a museum (which was open and turned out to be just around the corner), and then home and in bed by 8:30, the day done. Most days are jammed packed with stuff and others not so much. 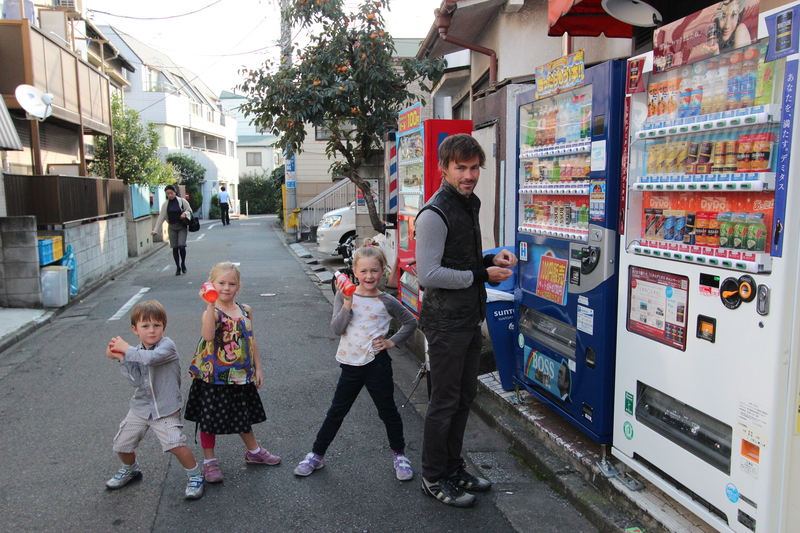 After hitting Japan hard for the past eight days (see Kyoto), we didn’t leave the flat until lunchtime yesterday. Gwen and Don did school for an hour, then the kids drew and coulored while we interneted and did laundry. There are at least five dozen restaurants within a fifteen minute walk of our flat. Many have only flags wafting in front of the door to indicate they are restaurants. 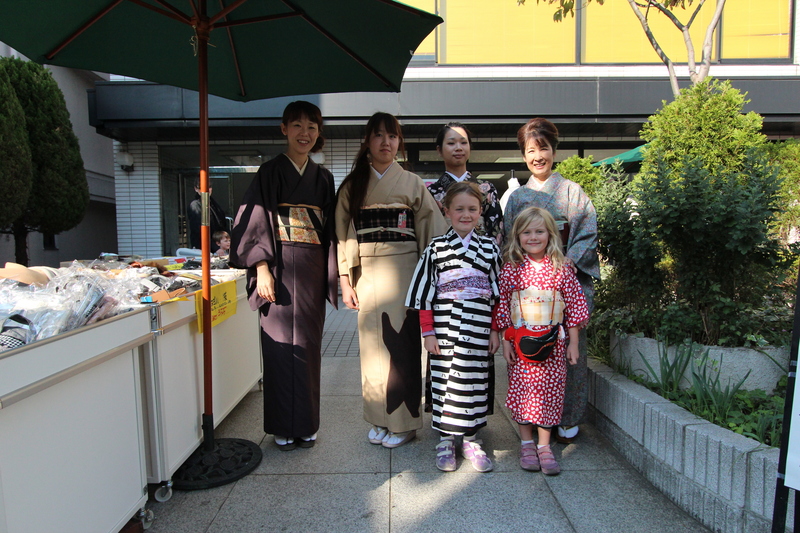 Almost everyone has been welcoming (we’ve only been turned down once for not speaking japanese). We never quite know what we’re ordering, but more then likely, we end up with some pickled something and various kinds of fish and sticky rice and everyone eats very well. The kids have learned to eat whatever there is or go hungry (a pleasant surprise). I’m not joking when I say there was a fight the other night over the last piece of beef tongue! Really! The kids were VERY concerned about what we were going to do for Halloween, it being the next biggest holiday to Christmas for them. Stores have oodles of pumpkin decorations but does anyone go trick or treating? So what to do? 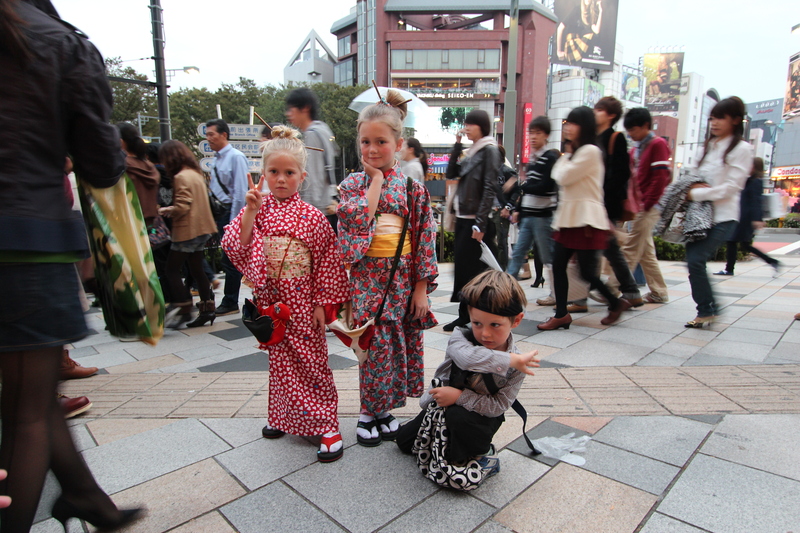 As luck would have it, on one of our wanders we passed by a kimono school selling funky kids kimono’s. Costumes, check! Now for some trick or treating. 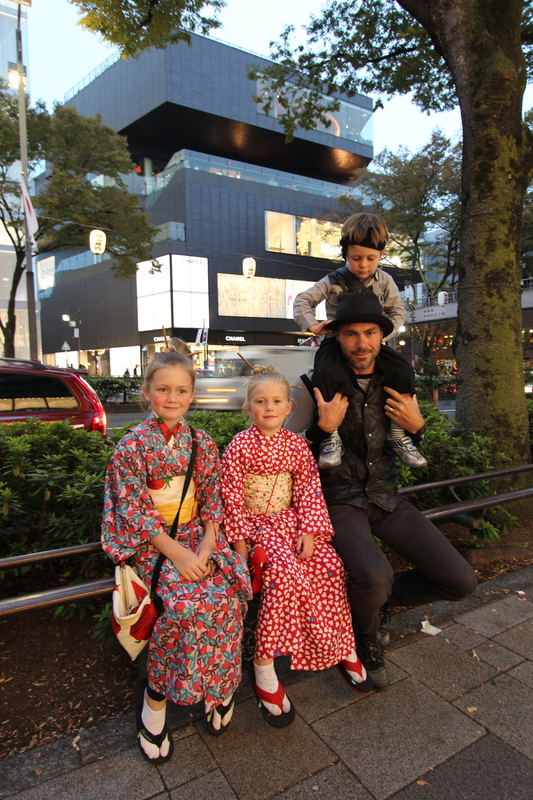 We had seen some little kids in costume near Omotesando (the fifth Ave of Tokyo), and we headed there in hopes of finding some kind of halloween festivities. 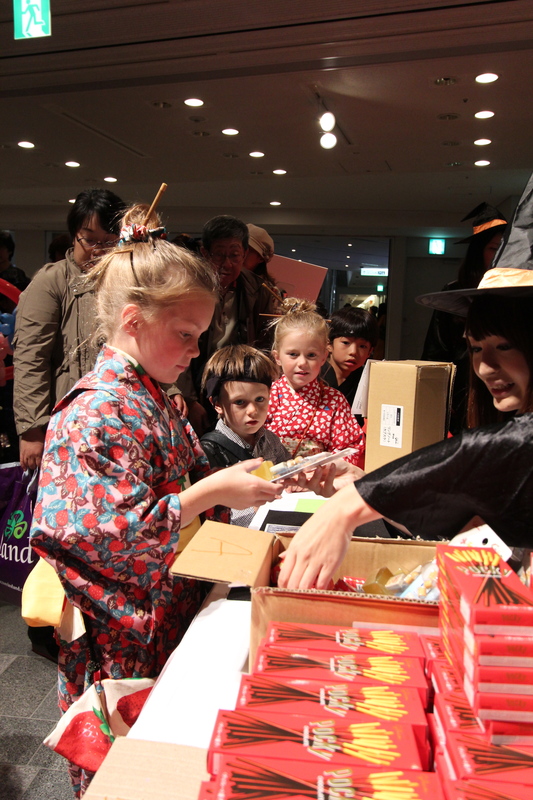 Trick or treating at Dolce an Gabana….only in Japan! We went to the fancy mall where they gave out multiple boxes of Polky (chocolate dipped sticks). Mission accomplished. “How will Santa find us?”… we’ll work on that next. 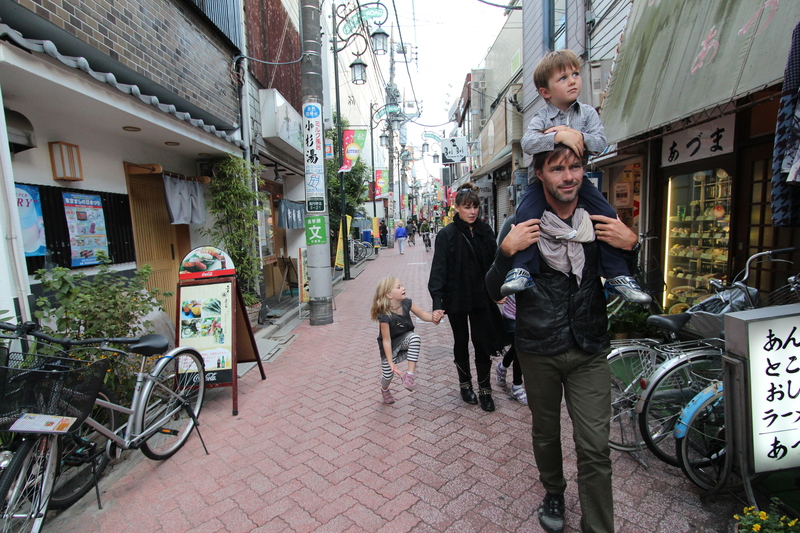 Tomorrow we’ll start our Tokyo finale and run around town seeing and experiencing as much as possible. 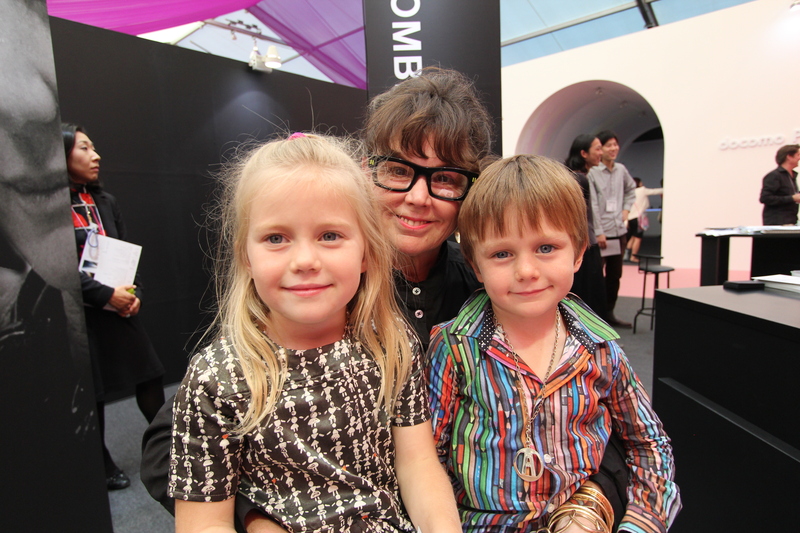 Up until now we have spent every waking moment with our kids. EVERY WAKING MOMENT FOR A MONTH! So this week we are going to invest in few babysitters before we go crazy. It’s not a cheap affair (one quote came in close to $1000…puts a little pressure on the night). Fortunately, we’ve found another (cheaper) option. 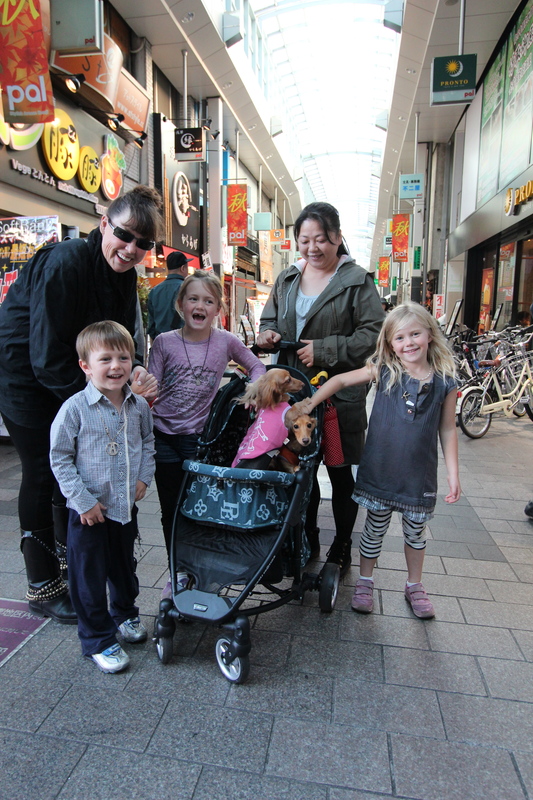 We are living in Nakano, a few stops from the heart of tokyo. By subway every neighborhood seems close together, but once you drive or walk, especially, you realize that Tokyo is made up of thousands of little narrow streets. 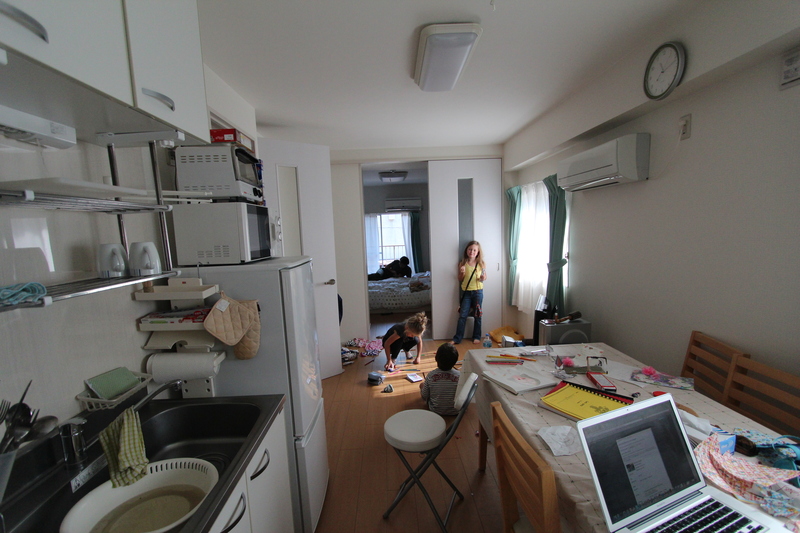 Our apartment is big by Tokyo standards and is in a lively neighborhood with lots of other kids. At night when we come home from a day out on the town, they run to see if their new friends can play. We spent the last two days with my Mom, which has been really really nice. She has an interior design show on here and we’ll hit the town with her after an evening reception on Friday. I’ve enjoyed Japan, but I will be happy to move on. We leave for Thailand on Saturday. That’s right, Thailand! Isn’t it just like the Anderson’s to go hopping about in countries that have had disasters. According to Don, we are going to an area with no flooding…I’m sure he’s right. He spends most of his downtime researching, so he almost always knows more then anyone else. He is an amazing planner. 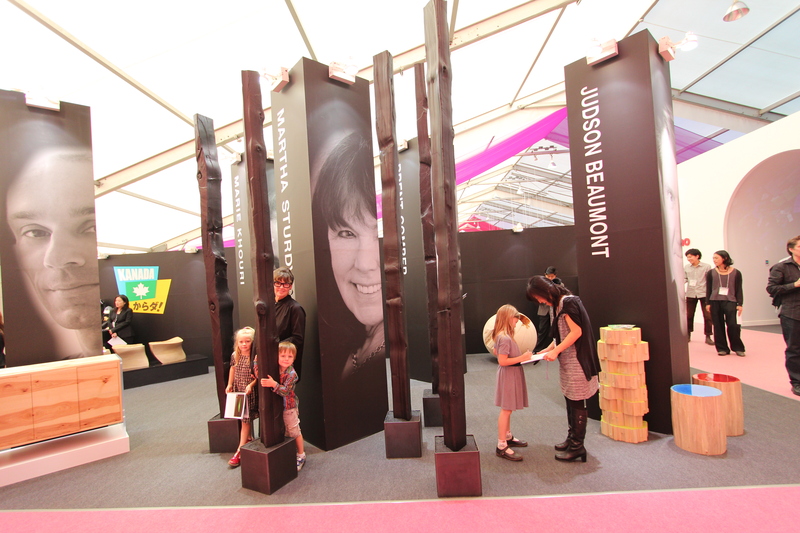 My mom’s booth at the interior design show. Stops at the drink machines. A daily event. 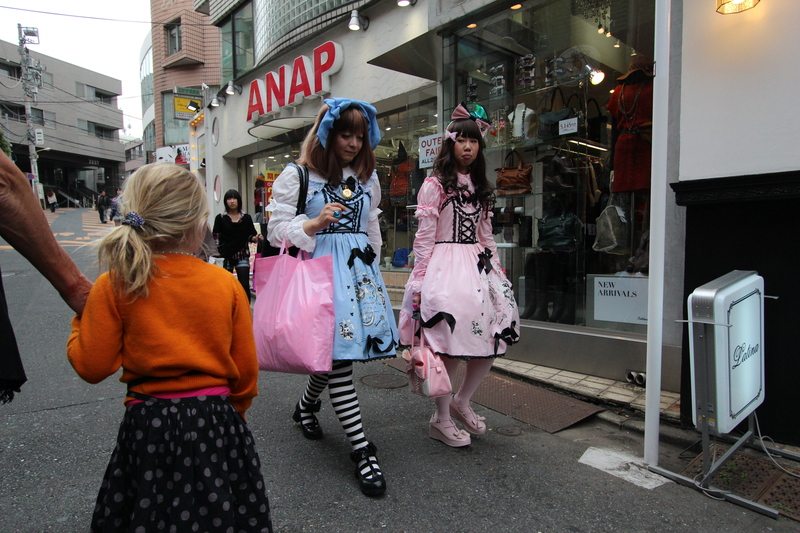 Harajuku girls checking out miss Kate. Hanging out with JB. It does sometimes feel like we (Don and I) are travelling with celebrities. 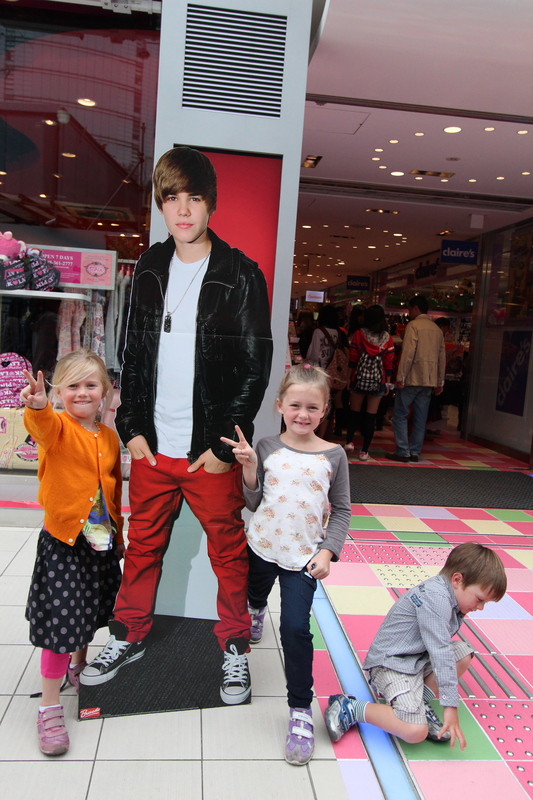 Everyone stares at our children (yes they are loud, but really!!! ), and some have even asked to take their picture. Yesterday, someone took their picture even asked what they were wearing (brands of clothes). Wandering through the red light district of Koenji (well pink light anyway). Lady and three dogs in jeans (the dogs, that is). Don, Jess, Gwen, Kate and Ashton what a wonderful trip you are enjoying. It is great to hear what you guys are up to and we appreciate the updates. I look forward to them! I am not surprised that people want to take the children’s pictures the girls are so pretty and Ashton looks like a charmer and has gotten so tall. Have fun, travel safe and hugs to all. How lovely to be able to enjoy a couple of days with your Mom Jess. Love Andy & Noeleen. Jess you write so beautifully!! I feel like I am there living your experiences! Living vicariously through your awesome descriptions! Hope you and Don had a fun nite out on your own! Great your mum was there for a few days! Jess, I was so into reading your latest journal I forgot to turn on the espresso machine—that is something for me! keep the travel log coming! I am here in Naples with Juy and Greg—golf tomorrow.